Ian told me that if I want to get to Mason Bay before dark, that it isn’t worth it to go around the mud on the track. We went through the Paterson Inlet and then up the Freshwater River. Ian has to time the ride to go at high tide. At 6:00, I was at the starting point. For a few minutes I went around the mud, but then my boots sunk in and got filled up quickly. At that point I realized there was no escaping the mud, and I didn’t really care if I wrecked my boots. The girl and a young man from DOC were right behind me as well. We all walked together through the thick mud, with some of it up to our knees. The girl had never seen a wild kiwi, either. About an hour into our walk, it happened right before my eyes: a kiwi ran straight in front of us! We were so silent and still in complete awe! From now on I can call myself a real Kiwi because I’ve seen one. I was able to get some photos while I had a great big smile on my face. In New Zealand I really had to go the extra mile to see a kiwi; seeing a koala in Australia was easy compared to seeing a kiwi here. Along I walked, thinking I’d see another kiwi straight ahead. For over an hour I went through dense bush and thick mud. I may have to get new boots for Milford Track. About two hours into the walk, I was in a big valley. It’s surprising that there are no homes built out here, because the scenery is unbelievable. Craig told me there were a few farms at Mason Bay until the 1980s. Much of Stewart Island is now Rakiura National Park. A lot of people underestimate the sheer size of Stewart Island because it looks like a little dot on a map (if it appears at all) but it is enormous! Another young man from DOC met us, and he said we were only about an hour from Mason Bay. It was beginning to rain again. For awhile I was carrying my tent and sleeping bag in my hand, but they helped me set it up so that it was all on my back. They also told me that I’d need a better bag for Milford Track, but this bag as worked fine on several trips, including the Inca Trail. It was getting dark and I just wanted to get my mud-filled boots off and have a cup of tea. Some of the mud in a swampy area was up to our knees. I ended up not seeing anymore kiwi tonight, but I have all of tomorrow to search. Finally, at about 9:00 I was at the place where the DOC workers stay. They allowed me to come in and have a cup of tea. It also felt great to get my boots off. After finishing my tea I put my boots back on and took the 15-minute walk to the Mason Bay hut. There was a fire there and I was all warm and toasty after a long day of tramping. Today was a bit of preparation for Milford Track, only that will probably be a little bit easier (but not much). There was a girl named Anne, from Australia. It was really cold out, and the ground was so cold that my feet were hurting as I was pitching my tent. Anne tramped the entire Northwest Circuit and has seen four kiwi. I had a cup of tea and sat for a good while, even after everyone else went to sleep. It was very cold out and I was reluctant to go to my tent. I eventually did go, even though it is cold enough out here that I should be on Man vs. Wild. I’ll see you tomorrow after some kiwi-spotting. Today was a rough day out in the Stewart Island wilderness. At 4:30 the wind blew so hard that the top flew straight off of my tent. As a result I got all wet from the rain. There was one bunk left inside the hut, so I went in there to lie down. I ended up sleeping in until almost 11:30. Because of the rain I was basically stuck inside the hut. It was freezing and I couldn’t get a fire started; wasting like 20 matches in the process. For like two hours I sat there, until three deer hunters showed up. One of them, Mike, helped me set up a fire but it went out. Another hunter, Lex, is from Bluff and he actually let me use the phone at his hotel last week. This morning for breakfast I had a can of fruit salad and I drank a Red Bull. Lex boiled some water, so he let me have a cup of tea. For that I gave him a red bush tea bag. He also gave me a piece of an orange. When the rain slowed, he packed up and continued onto the next hut. For several hours I sat there, hoping the powerful wind and rain/hail would slow. Thanks to those hunters I was warm. For awhile this morning I thought about going to the DOC hut and asking them to send Ian a radio message to pick me up but then I told myself to relish the moment and enjoy the experience. Only a handful of people get to visit Stewart Island, and only a few of those get to visit places like Mason Bay. At one point I had some cold porridge but since I had the fire I could make hot food by placing the billy on top of the fireplace. I made a cup of billy tea. My boots were still wet, so I couldn’t really go out. When I tried to dry my socks on top of the fireplace I burnt a hole in one of them. I did the same thing in Peru, only on top of a heat lamp. At about 5:30 I decided not to let not having footwear stop me and walk barefoot to Mason Bay. So, I took the 15-minute walk, sometimes through mud and then sand, to Mason Bay. In Dunedin, Joshua told me that he’s done several of the Great Walks barefoot; he goes barefoot everywhere, so there’s nothing wrong with it. My eyes were fixated on the splendid landscape. My feet were freezing and I feared getting frostbite. I then decided to go back and come a bit later. Kiwi are active just before darkness. During the walk I saw some kiwi tracks and beak holes, but no kiwi. Back at the hut I warmed my feet up. There was a box full of left-behind food like chutney, juice mix, etc. I took a few things. About 10 minutes later as I was making spaghetti for dinner, a group of young people showed up. Earlier I was frustrated about burning a hole in my sock, so I threw that pair into the fire. One girl, Nadine, recognized me from Toni’s Guesthouse in Tonga. She’s studying geology at University of Otago. We’re all hoping that McCain wasn’t elected today. I then decided to put plastic bags inside my boots. It was 8:00 and when I asked everyone if they wanted to go kiwi spotting, no one was up for it because they had been walking all day. They still have another five days to go. Out I went, with my boots on this time searching for the elusive kiwi. Searching for kiwi is a bit like searching for Sasquatch or Nessie. Little do people know that I’m a bit of an amateur crypto zoologist. It is said that 99% of Kiwis have never seen a kiwi. Oh, and I forgot to mention: the plural for kiwi (bird) is kiwi (with no S) and the plural for Kiwi (New Zealander) is Kiwis. Maoris call brown kiwi tokoeka. It was biting cold out and I was searching high and low for the elusive kiwi while getting rained on. This has been an amazing journey! I’ll be talking about this place for the rest of my life! After looking for about 20 minutes, I decided to go back to where I saw the kiwi tracks earlier. Sure enough they were still there and then I decided to follow the tracks. Then, right before my eyes, was a kiwi. I got a lot of photos. At one point the flightless bird was only like six inches from me. 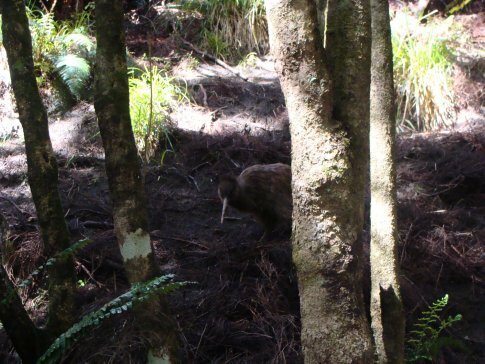 For about 10 minutes I observed the kiwi hunting and eating until I started to head back. Two kiwi on one trip to Stewart Island! That’s incredible! It was almost dark by the time I got back. The group was preparing their dinner. I just munched on some crackers and then packed up my tent. Nadine made the decision to sleep in the main area of the hut. I followed her lead because the bunk area is very cold. The door is broken. It was even snowing for a wee bit earlier today. There is a giant whale bone out in front of the hut that I’d love to take home but it’s extremely heavy and I’m not sure if I could take it out of the country (or into the U.S.). I lit a candle and then made a cup of billy tea before deciding to lie down. It was raining hard while I curled up in my sleeping bag. Another set of islands I want to visit is the Chatham Islands, but it’s very expensive to fly there. Stewart Island really is a special place; it’s very picturesque and only a handful of visitors to New Zealand come here. Tomorrow I have to take the four hour walk, likely through mud, back to Freshwater River, so I have to get up early. I’ll see you soon. G’night.